It's still plenty hot here in Spokane, but the temperatures are starting to drop more quickly at night, and the mornings are nice and cool. This slight change in the weather reminds me that fall is on its way, and with it, new knitting projects! My dad was a teacher and my mom worked at my high school, so the "new year" for our family was in September more than in January. The new school year was always a fresh start, with new clothes, shoes, and a sense that anything was possible. So it is with knitting, at least for me. Fall is the new year for knitting, time to pick new projects, new yarn, and fresh inspiration. The fall magazines are coming, too, and that takes care of the inspiration part! 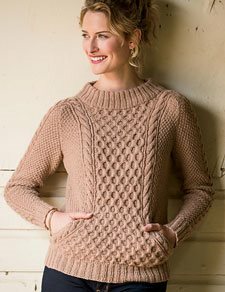 Interweave Knits fall 2014 just arrived at my house, and, as always, there's a stunner or two within. My favorite is the Ropemaker Pullover by Ashley Rao. The honeycomb cable on the front is fabulous, and the pockets! A total bonus, and they look fun to knit, too. I really love the neckline; it's the perfect casual finish. 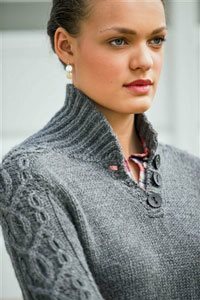 The second runner-up for me is Vanessa Ewing's Hitch Pullover. I'm really attracted to the shawl collar, and, of course, to the beautiful cable that travels from the saddle shoulder to the wrist. It's a classic. Here's Knits editor Lisa Shroyer to share the interesting story of one of the photo shoot locations for the fall issue, and to tell you more about what's inside! The location we used for the Horse Country story in this issue is a guest ranch along the Big Thompson River outside of Loveland, Colorado. The floods of 2013 ravaged this area—ravaged this property, in fact. I remember the ranch as the site of Interweave corporate retreats and holiday parties over the years—a lush, rolling patch of land with the foothills of the Rockies in sight. With lovely stables and horses, rope swings along the river, friendly hosts. When we shot our photography there in May 2014, we saw the scars of the flood damage. The ranch workers were gearing up for their season and working tirelessly to repair the buildings, rebuild, lay new sod. A whole new bridge had been constructed over the river—which, as I drove over it, was high and moving fast. Snowmelt in the high country was in full swing. But the place is still beautiful and the people warm and welcoming; our photo shoot was a great success. I take time to point out the story of the Sylvan Dale Guest Ranch because it's an independent business that has been, and always will be, vulnerable to the forces of nature and the greater economy. 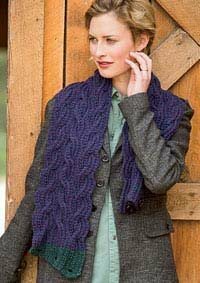 We see this in the knitting industry, as well; many of the yarn companies you love, and the companies covered in the Yarn Review, are small to medium-size manufacturers and distributors. The yarn-makers, dyers, needle-makers, pattern designers, and all the other contributors to our industry work hard, usually with slim profit margins. The farmers who raise the sheep and alpaca and goats are highly dependent upon and affected by nature—drought, predators, disease. It's a small industry that works best when we're all connected. It's so refreshing to see "competitors" share with and support each other at trade shows, at fiber festivals, and in new initiatives. Hearing Clara Parkes speak at Interweave Knitting Lab in May really brought home to me the idea of yarn, fiber, and our community as precious commodities. I was also lucky enough to spend time with Donna Druchunas at another event in April; take time to read her essay about that experience in Ravelings. 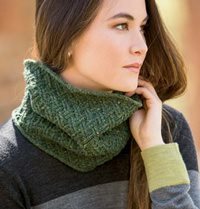 The Tandem Scarf, by Robin Melanson, buttons into a thick, cozy cowl. Getting out to the events and festivals is a great way to maintain the thread of connection we share as knitters, to keep the spirit of our craft alive—the same way an online forum can keep us connected; the same way knit night at your LYS can; the same way teaching a new knitter can. Reach out, knit something that inspires you, support the companies you love, and share your inspiration with others. Keep our precious yarn world thriving. P.S. Do you have knitting plans for the fall? Leave a comment and share them with us!